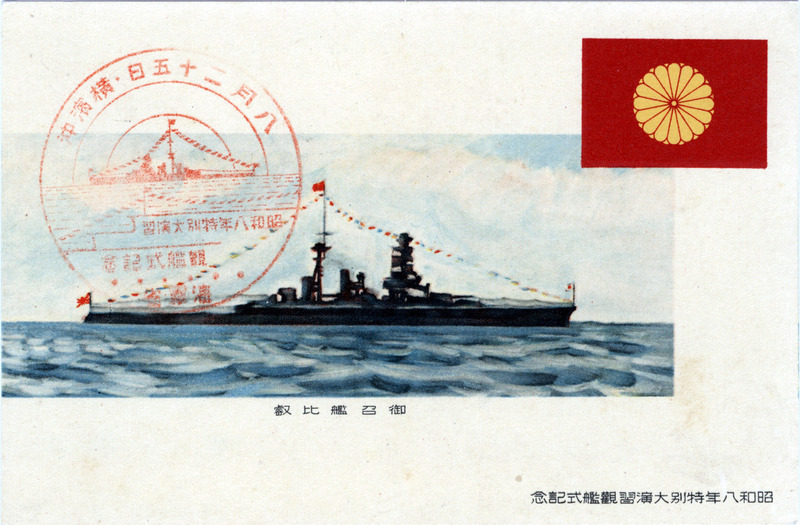 Battlecruiser Hiei, serving as the Emperor’s flagship during the 1933 Imperial Navy Review in Tokyo Bay, August 25-26. The Imperial Standard, the 16-petal golden chrysanthemum crest, is pictured at upper-right. From the wiki: “Hiei [named for Mount Hiei, near Kyoto] was a warship of the Imperial Japanese Navy during World War I and World War II. Designed by British naval architect George Thurston, she was the second launched of four Kongō-class battlecruisers, among the most heavily armed ships in any navy when built. Laid down in 1911 at the Yokosuka Naval Arsenal, Hiei was formally commissioned in 1914. She patrolled off the Chinese coast on several occasions during World War I, and helped with rescue efforts following the 1923 Great Kantō earthquake. “To avoid having to scrap Hiei under the terms of the Washington Treaty, the Imperial Japanese Navy was allowed under treaty terms to convert Hiei into a demilitarized training ship. On 15 October 1929, she went into drydock at Kure Naval Arsenal. Her aft 14-inch gun turrets were removed, as well as her 6-inch guns and armor belt. All but nine of her boilers were taken out, reducing her speed to 18 knots (20 mph), and one of her three funnels was removed. From the end of May 1933 to 13 August, Hiei received upgrades that allowed her to perform regular duties for the Emperor, and she served as the Emperor’s observation ship for the Imperial Naval Review on August 25-26, 1933, and served as Emperor Hirohito’s naval transport in the mid-1930s. “On February 25, 1931, Japan withdrew from the League of Nations after the League ruled that Japan had violated Chinese sovereignty and international law with her invasion of Manchuria. The withdrawal also signaled Japan’s exit from the Washington and London Naval Treaties, which removed all restrictions on the Imperial Japanese Navy’s construction and reconstruction of capital ships. Beginning in 1937, Hiei underwent a full-scale reconstruction that completely rebuilt her superstructure, upgraded her powerplant, and equipped her with launch catapults for floatplanes. Now fast enough (30 knots/35 mph) to accompany Japan’s growing fleet of aircraft carriers, Hiei was reclassified as a fast battleship. On the eve of the US entry into World War II, she sailed as part of Vice-Admiral Chuichi Nagumo’s Combined Fleet, escorting the six carriers that attacked Pearl Harbor on 7 December 1941.